Experience the exciting resurgence of local arts and culture on this Las Vegas walking tour. See what makes the true heart of Las Vegas tick! Explore the “Cultural Corridor,” Vegas’s oldest arts district, home to the legendary Neon Museum Boneyard! Hear the story of historic Stewart Ranch, the original Las Vegas homestead! Experience lively old Fremont Street with its classic casinos and creative buskers! Visit the historic El Cortez hotel, once owned by mobster Bugsy Siegel! Your journey begins in the Cultural Corridor, Las Vegas’s oldest arts neighborhood. Starting outside of the famed Neon Museum Boneyard, you’ll enjoy a light refreshment as your guide introduces you to this first remarkable landmark. Home to over 500 salvaged significant neon signs, the Neon Museum offers an epic chronical of the ever-evolving Strip. The Cultural Corridor is also home to Stewart Ranch, the land that started it all! While Las Vegas itself wasn’t founded until 1905, the community established itself decades before with the sprawling Stewart Ranch. Now a state park, the authentically recreated ranch is an amazing historic Las Vegas site few visitors know of! Then it’s off to Fremont Street, where the earliest Vegas casinos rose from the sand. Today, the Fremont Street district is a pedestrian playground, dominated by the world’s largest video screen and home to a bevy of local street performers. Crossing Las Vegas Boulevard at the iconic Horse & Rider sign, you’ll journey to Fremont East, Las Vegas’s newest entertainment neighborhood. This newest district provides locals a space for festivals, public art, and a range of locally owned small businesses, restaurants, and bars. 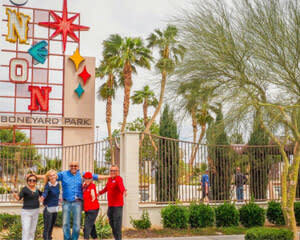 Encounter a side of Las Vegas most tourists never even notice! Your voyage through Vegas ends at the epitome of old Sin City, the El Cortez Hotel. Once owned by Murder Inc. members Bugsy Siegel and Meyer Lansky, the El Cortez is the essence of old Las Vegas with its neon charm and maybe even a ghost or two!